Tired of keeping up with having to continually update your eyeglasses prescriptions and the hassle of keeping, cleaning and storing your contacts? If you’re looking for the best way to finally get rid of your eyeglasses or contacts once and for all, we’re the practice to come to! Eye Services of Jackson, in Jackson, MI is constantly in search of the best and most convenient ways to help you obtain and maintain your best vision, and work closely with some of the best eye surgeons in the area to provide you with state-of-the-art options in LASIK and refractive surgery co-management. Proper co-management includes both pre-op preparation and post-op follow-up to make 100% sure that you are properly prepared and informed about every aspect of your eye surgery, and that you are healing up perfectly and comfortably afterward. At Eye Services of Jackson, we'll answer all your questions about laser vision correction so that you can decide if it is right for you. Patients who have chosen Eye Services of Jackson for laser vision correction overwhelmingly believe that it has changed their lives. They are no longer dependent on eyewear to maintain their sight and can enjoy everyday activities like sports, driving and cooking - without glasses. 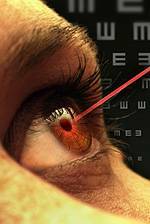 Call us today to schedule a free screening to determine if you are a candidate for laser vision correction. Review of eye history and refractive stability, to rule out conditions that may preclude lasik, such as chronic dry eye.